Over the course of the years, I've found myself in attendance at a number of music industry trade shows - winter and summer NAMMs, the Frankfurt Musikmesse, and Superbooth, to name a few. Each and every one of them is a sprawling, aurally/visually assaultive, and thoroughly addictive treasure hunt of one sort or another. I've added a new gathering to my list - KnobCon. Although this weekend was the seventh edition of the show, it was my first time (although I knew about the buzz about the show and its particular vibe, the date was such that I was often out of the country or on the road myself). This year, the stars aligned, it was a short drive from my geolocality, and the ticket price was wonderfully right. So off I went. Here's some of what happened. The event was held over three days near Chicago in a Hyatt hotel right off of the Interstate - an easy access event. The hotel was reasonably priced, which meant that quite a lot of the exhibitor and attendee community mixed throughout the event, which was kind of unusual but very cool. The Con was very reasonably priced - 55 bucks for access for all three days and all the events. What a bargain it was, too. Our weekend consisted of workshops, performances, opportunities to jam, build workshops, and chances to meet developers, analog synth vendors, and enthusiasts of nearly every stripe. Throughout the event, we were under the watchful eye of the Suit & Tie Guy (sorry - I just love the way that phrase rolls off the tongue), the gracious empressario (and - in this photo - the um... Behrer of the RD-909, one of the physical objects whose presence excited many attendees). If you're unfamiliar with him, my pal Darwin Grosse had a nice long chat with him as part of his Art + Music + Technology podcast. If you're unfamiliar with his work, have a listen. 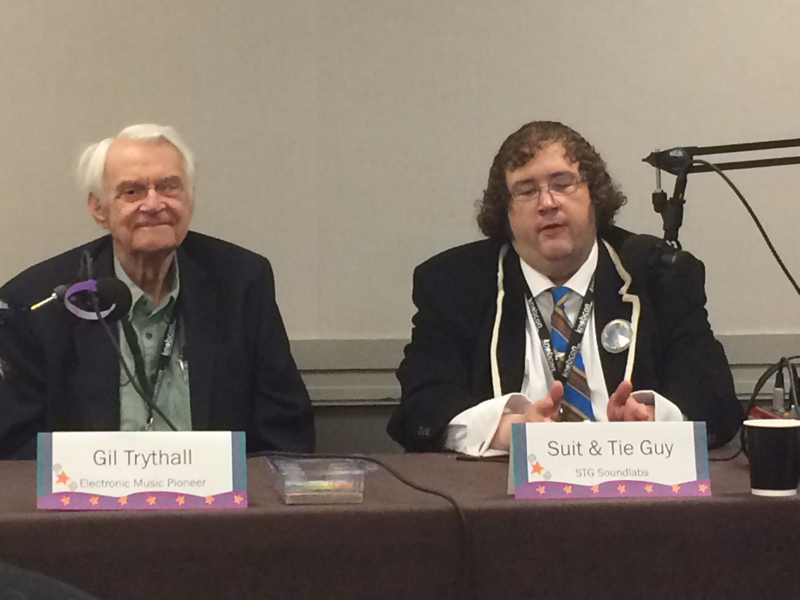 Gil Trythall was the guest of honor for KnobCon Seven - a real treat for me, since his Country Moog recording was something I saved my pennies for waaaaaaay back when I was a Middle School banjo player struggling to learn the banjo part to Pretty Boy Floyd The Outlaw. He was an affable presence all weekend - charming and humble, a great raconteur at the Saturday night banquet, and a lot of fun during his "Ask Gil Anything" session that the Suit & Tie Guy moderated on Sunday afternoon. Again - KnobCon is one of those events where you actually have a chance to meet and maybe chat with your heroes. Sure - it's about electronic music and all, but this KnobCon really stood out for me personally about the show was the visibility of analog visual synthesis. 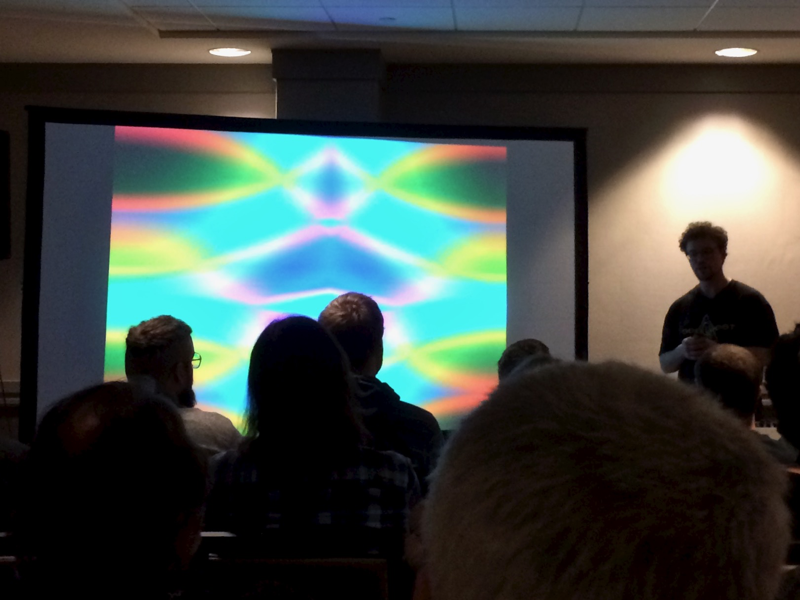 The show included a fantastic workshop by Lars Larsen of LZX industries - one of those talks on analog video that was solidly pitched at leveraging what analog synth folks already know when getting comfortable with video synthesis in the analog realm. You could sit in the back during the talk and just watch the lights go on. In addition to LZX, there were some other interesting thing to see and people to talk to - modules from Nick Ciontea of brownshoesonly, the Erogenous Tones guys with a prototype of their new visual synthesis module Structure, and - last but certainly not least, 1010 Music's new Laserbox - a Eurorack module that lets you drive a laser by generating and modulating patterns that use premade image wave files, or via CV signals received from other Eurorack modules. You can use modulation to control the shape of the wave signal, the colors, the position of the projection, and the rotation of the projection. There's even a helpful display on the module that shows you what you're creating. 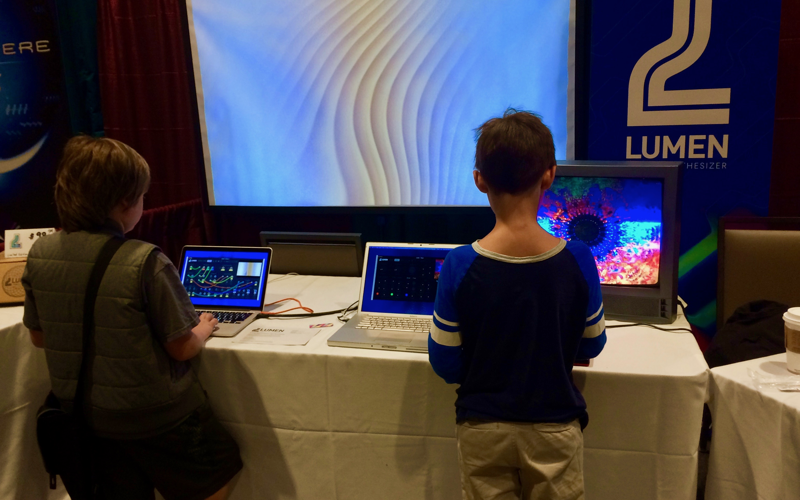 A final and interesting addition to all this analog hardware was a software homage to analog video synthesis: Lumen. If you've spent any time looking at Kevin Kripper's Vsynth work in the Max Package manager, then you'll certainly have an idea of what you're likely to see. Lumen takes those ideas and puts simple and well-designed approaches to their realization at your disposal - and under your fingers using an external controller - quickly and easily (my personal thanks to the Lumen folks for their in-booth video toaster and Pop Tarts for refreshment and nourishment). I don't know about you, but I will often head off to a trade show or convention with a set of goals in mind - looking for the appearance of things that were in development, checking with my favorite vendors on their most recent offerings, and generally putting myself in a position to find something new. KnobCon's a great place to do that. Perhaps "the shock of the new" is too severe a word to use as a general approach when it comes to novelty. Often, what's "new" is a friendly tap on the shoulder instead of a poke with a stick. 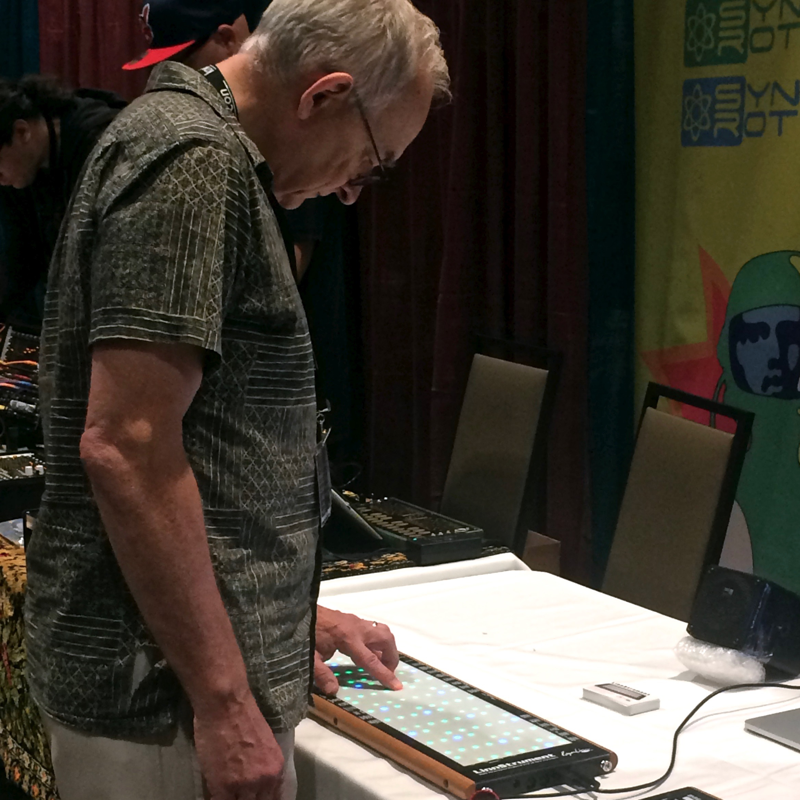 Roger Linn was on hand with his Linnstrument, which continues its reasoned and thoughtful addition of new features. I hadn't really checked in with the most recent firmware update (which dates from the end of July). There's some great new stuff there - although the Linnstrument has been an MPE device from the beginning (the recent International MIDI Association's MPE spec formalized what the Linnstrument was doing all along), the most recent update adds virtual activation and the ability to send common MPE messages over all channels. Roger also continues to add and refine features, too - increasing the number of settings memories, and continuing to update and improve the sequencing portion of the instrument. This wonderful instrument just keeps getting better, one step at a time. Besides - how often to you have a chance to thank Roger Linn for everything in person? 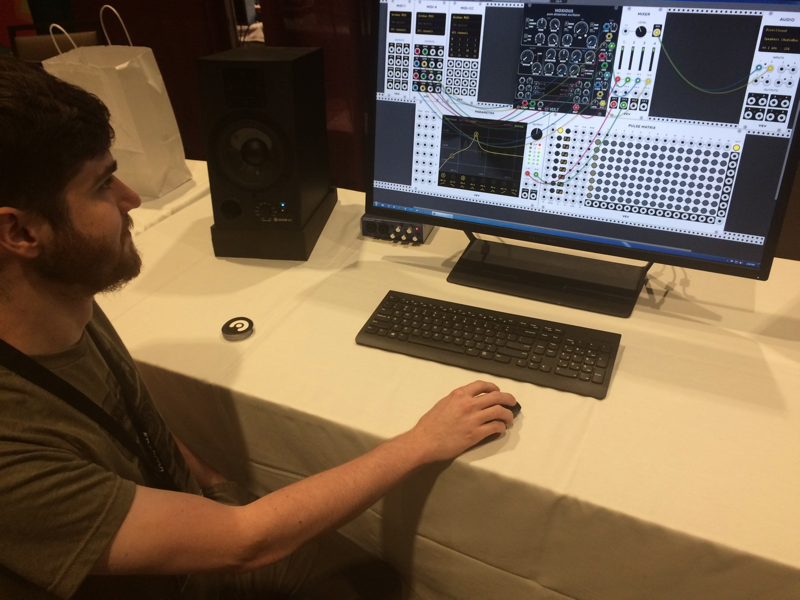 I had initially made my way to the 4MS booth in search of their Spherical Wavetable Navigator - I'd seen it in action early on at Superbooth, but found no mention of it on their website. It reappeared in public again for NAMM 2018, but still remained elusive. There is was in their rack, and the word is that it's on its way. But what really caught my interest was something new and entirely different from 4MS: a 6HP Eurorack stereo WAV-to-SD card recorder module. The WAV recorder is simplicity itself: grab the input, toggle the record (button or square wave), hit the playback, and you're off to the races. One of those things that sets the 4MS folks apart was that their nifty little user manual sported a well-researched listing of SD cards sizes and features, along with recommendations on the ones you want in your rack. Thanks, guys! Since I figured that Paul Schreiber of Synthesis Technology might be around, I figured it'd be a good chance to check on his Quad Morphing VCO - a new module that combines his Morphing Terrarium and Cloud Generator with a 4-channel DSP-based VCO. I'd watched the Kickstarter for the project, and - there it was. It did not disappoint, and the build quality on the module is amazing - knobs sturdy and smooth as the action on a Steinway. The other "I found this while looking for something else" surprise in Paul's booth was something I wasn't expecting: a CS-80 filter module/VCA combination in current development. I wish things had been quiet enough for a real listen to the filter - I particularly love the CS-80 for precisely that filter, but keep an eye peeled for that bad boy. My final must-see catch-up visit was with Andrew Belt of VCV. 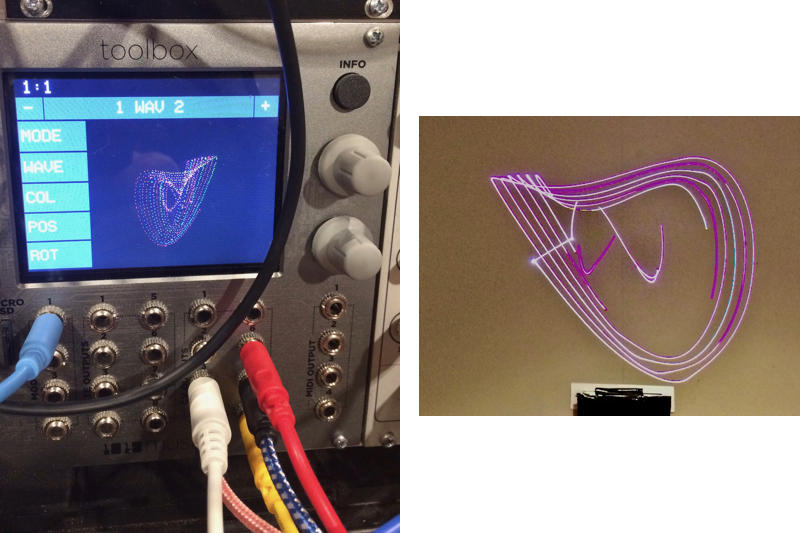 His appearance on Darwin Grosse's Art + Music + Technology podcast had really piqued my interest in the progress of VCV's open source virtual Eurorack. Its recent growth has included a complete set of virtual Mutable Instrument modules that I've actually used as a way to "test" how useful something I don't own is likely to be for my practice (and yes, they really do sound that good). The good news (intriguingly under wraps) is that some large new collections of synth modules are on the way in the months to come. In the meanwhile, there's the addition of their own Spectra spectral designer, Parametra filter designer, Scalar quantizer and scale tuner (catnip for non-Western tuning users such as myself - the virtual Eurorack has just gone microtonal! ), and a host of amazing user-contributed modules. 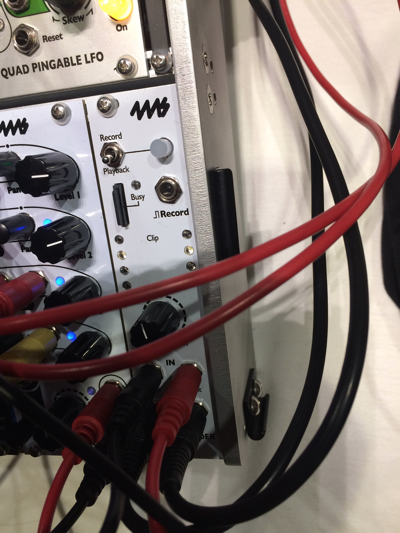 And yeah, there are modules that serve as audio and MIDI bridges to your virtual rack, which means that there's some Max/MSP control fun and mayhem lurking on the horizon, too. 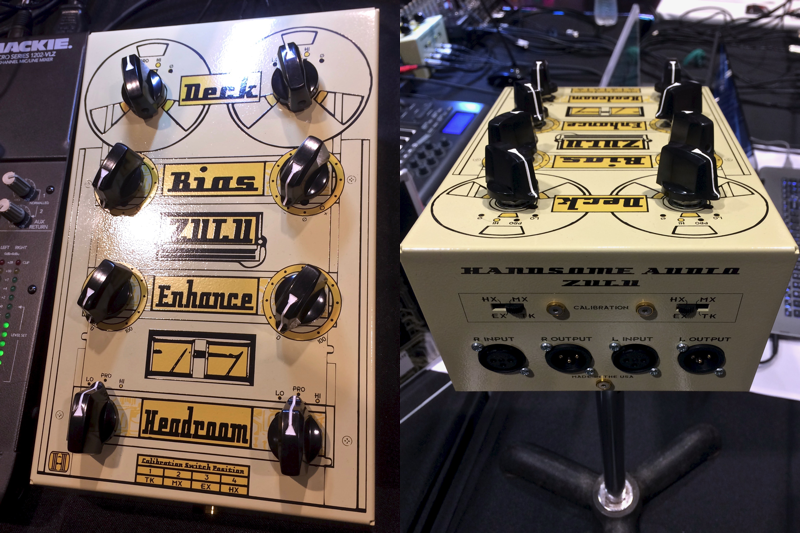 For me, one of the great things about KnobCon's scale involved the ability to actually spend some quality time with gear - to get that all-important 20,000 foot overview from a knowledgeable booth person, and then don the headphones and man the dials and sliders. I'd read the announcements and seen the occasional photo on a site I frequent, but during my KnobCon ramble, I heard some suspiciously Vangelistic keyboard work, followed the sound to a Kurzweil keyboard connect to an actual real live rack CS-80 clone from Roman Fillipov of Sputnik Modular fame, quietly waited my turn, and then sat down and played and hit the faders. As you might imagine, the ambient background noise made it nearly impossible to appreciate what we all celebrate as the subtlety of the CS-80 filter (see the Synthesis Technology homage to that filter elsewhere in this article), but I could still fall in love with the polyphonic aftertouch and MPE stuff. I am also thinking that I particularly celebrate the existence of a CS-80 I wouldn't mind carrying up several flights of stairs, having wrestled with the real thing in times gone by. Dave Smith Instruments is no more. Well, actually, they're still going great guns under a name we've known and loved for years - Sequential. 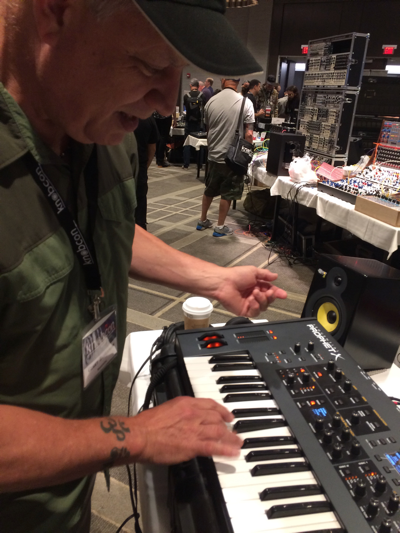 There they were, and there it was - a spanking new version of their Prophet-X hybrid sample synthesis/sample keyboard, with longtime demo sensei Gerry Bassermann minding the booth. Since Gerry and I have known each other for ages, his personalized demo cut to the chase - a quick sweep through the insanely sensible control layout, brief stops along the way for the sample modifications, layering, and sound-design possibilities, a dive into checking for support for microtonality. and then he stepped back and I was off. No way I got anywhere near the full 150-odd GB library of sample stuff, and I doubt I made the slightest dent in their layering and modulation, but it's an astounding machine that'll repay the time you invest in exploring it bigtime. 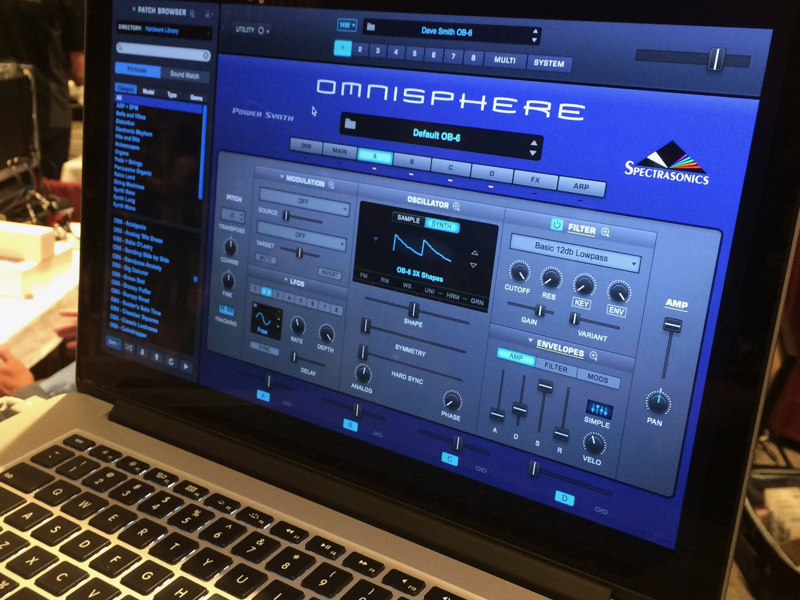 A number of my friends and colleagues have spoken highly of Spectrasonics' Omnisphere softsynth for ages - people who know my work well enough to figure it'd be a good choice for me. But there's a problem: the software requires so much space that a demo download is just going to be something that's not practical, so there'd have to be another way to interact with it. KnobCon to the rescue, and a timely one, at that. I got a look at the 2.5 release, which answered one of my big questions: how was I going to start making sense of something so large and complex if I didn't want to spend the rest of my life with someone else's presets (and, since I'd be working outside of Equal Temperament, presets that I'd almost certainly wind up tweaking)? Their solution for 2.5 is what they're calling "hardware synth integration" - think of it as something like a MIDI learn feature on steroids. Instead of mapping knobs, Omnisphere uses the layout of one of a number of hardware synths you already know well (they've got about 20 as of this writing synths from Moog, Sequential, Korg, Novation, Roland, etc.) as a starting point to explore Omnisphere sounds. It's one of those elegant ideas that seems totally obvious once you've seen it. Since finding ways to navigate a landscape of possibilities can be a struggle with complex systems, this release is a real winner. Serendipitous Encounters And then there are the things you weren't looking for at all - the unexpected device, the idiosyncratic approach that impresses, and the Good Idea Done Well that you weren't expecting to find. The rabbit hole I didn't expect to head down appeared in the form of a yellow box - Handsome Audio's Zulu. 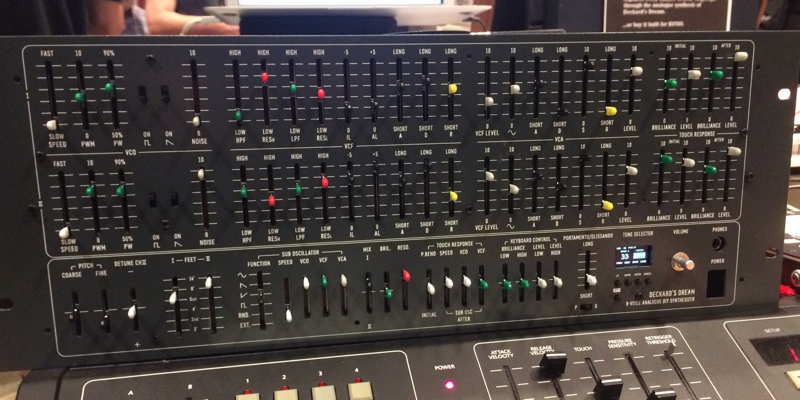 It's a passive analog tape simulator that uses analog modeling techniques to run the gamut of simulations from Ampex 456s to Cassette/lo-fi fun. And yeah, that's right - it's a passive device. Nothing on the back but a line in and out and some configuration switches. I was lucky enough to hear the box in action before the show really kicked off in earnest and things got loud, and "Wow," as they say. Matthew Weiss at Pro Audio Files gave it a more extensive writeup here , and you can hear the box in action on a pair of A/B demo here and here. I walked another 8 or 10 steps and met Daniel Lindmark, the "lead Believer" at Believotron, who sported the finest Keytaresque instrument in all of KnobCon, based on their Wanderlust instrument - 8 knobs, 4 displays, 4 video joysticks, and the ability to use the Axoloti programming environment to create your own mayhem. 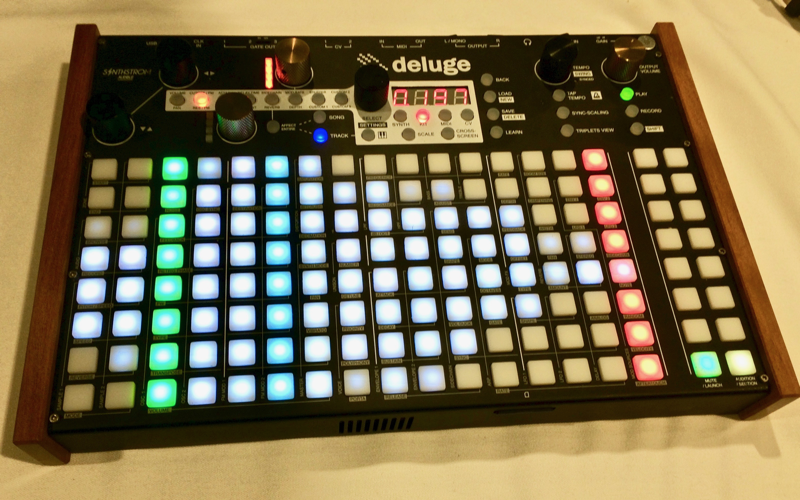 The "Robert Fripp Small Mobile Intelligent Unit" award of the show goes to an unexpected find - the Deluge, a beautifully sized, all-in-one battery-powered synth/sampler/sequencer/drum machine/recorder box that's a lot of fun, easy to carry around, and sounds pretty amazing. 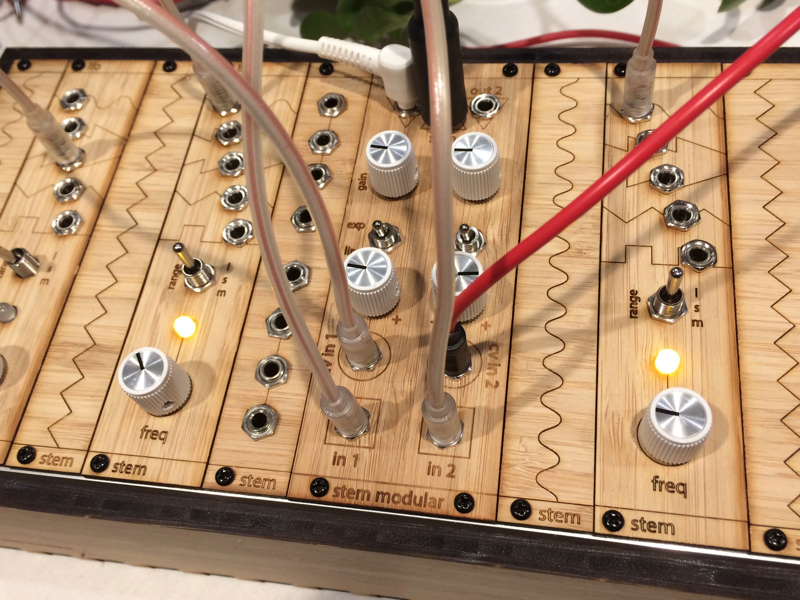 One surprising and heartening set of products connected with a personal interest of mine- the folks at Stem Modular work on integrating producing modular systems closely linked to STEM curriculum development. They're not only making synths, they're working to connect electronic music production with science, technology, engineering and math concepts - my winner for the "Heart In The Right Place" award, for sure. It's still early days, but this is the kind fo thing that bodes well for our educational future (to say nothing of helping to train the next generation of synthesists and engineers). But it wasn't all hanging out on the show floor. 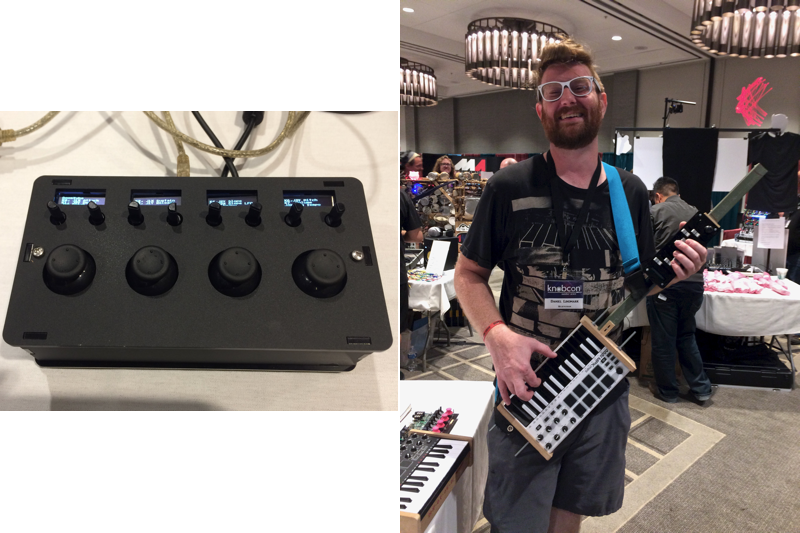 In addition to the workshops and discussions I mentioned earlier, there was ample opportunity to hear the gear at work during the evening concert events, a Jam Zone downstairs, and opportunities to build your own gear. If you were bored, you had no one to blame but yourself. But all that's over. It's Monday, I'm back home, back to work, I've got some stuff to follow up on, and I've already pencilled in the next KnobCon on my calendar. Great vibe, great scale, and - as my Mom and Dad's Kentucky hometown paper used to say, "...a good time was had by all." Really nice write up, I'm the wrong side of the pond to attend, but good to see someone trying to capture the flavour of an event like this.